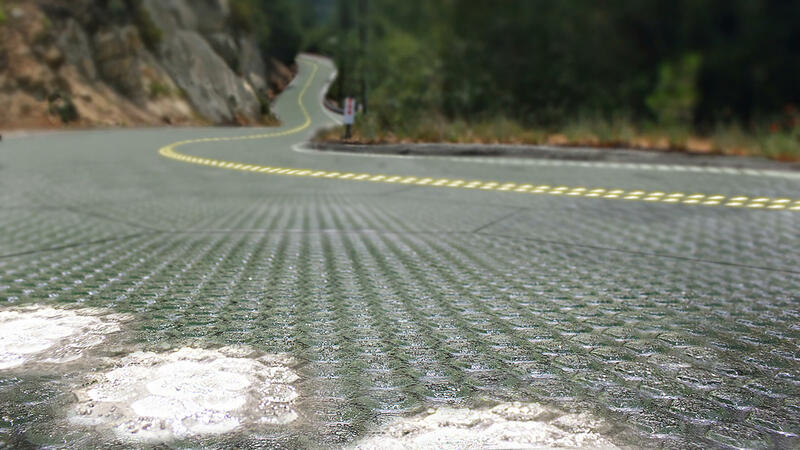 An artist's rendition of what a solar roadway could look like. Updated Nov. 5, 2017 with a statement from Solar Roadways - The Idaho vendor that planned to work with the Missouri Department of Transportation on a solar road initiative is disappointed the pilot project did not work out. In an email, Scott Brusaw with Solar Roadways said it was a complicated contract. He added it was "dissolved due to a variety of complex red tape factors." The statement did not expand on those factors. The company has a third contract with the U.S. Department of Transportation and has an upcoming installation in Colorado. Updated Nov. 2, 2017 with project on hold - A high-profile test program involving a solar road at a Missouri rest stop is not moving forward. The Missouri Department of Transportation says it had concerns about Idaho-based Solar Roadways ability to meet its obligations under an initial agreement announced last year. The company was to supply specially-made solar panels for a walkway at the stop near Conway, about 180 miles southwest of St. Louis, on old Route 66. The partnership breakdown is not related to money, said Bob Brendel, special assignments coordinator with the Missouri Department of Transportation. "This was less than a $100,000 project that was going to be funded with dedicated research funds, both federal and state. And the fact that we couldn't reach a contract agreement had nothing to do with cost." The state was trying to finalize a deal with the Idaho company, which now appears to be focusing on projects closer to that state. Officials with Solar Roadways have not returned emails from St. Louis Public Radio. The developments don't leave MoDOT with plenty of options for conducting solar research for potential upgrades to state highways. "There is a similar company in France," said Brendel. "And I believe they are looking at potential deployments in the United States. But that hasn't happened yet." The solar road pilot project was part of MoDOT's Road to Tomorrow initiative. It aims to study innovative technologies on Missouri highways. That overall program is still in place, despite problems with the solar road rollout. Original story from Aug. 1, 2016 - The year is 2091 and you have a business trip to make to Kansas City. You wake up in the morning, ask the speaker in your wall for a car to be brought to your door to take you there. A car arrives, no driver, naturally, and you set up camp in the back seat with your laptop to prepare for a big meeting. The car, dodging traffic reported along Forest Park Parkway, hops onto I-70 and into a line of other driver-less cars along a solar-paneled highway. There’s a tree down ahead in your lane. Without skipping a beat, the car switches to another lane, marked by adaptable LED lights, created by an engineer who was alerted of the issue. Your car continues in traffic-less ease for two hours until the electricity the car runs on starts to run out. Not to worry, with a voice command authorizing a charge from MODOT, the car starts charging itself from the solar paneled roadway. You make it to Kansas City in record time, dropped off at the door without having to worry about parking, and you’ve done four hours of billable work on the way to your meeting. Sounds like “The Jetsons,” doesn’t it? That future may very well be closer than you think, or at least parts of it, if Tom Blair, MoDOT’s assistant district engineer for operations, has anything to say about it. What could the future of Missouri's roads look like? MODOT's Tom Blair discusses the wide array of possibilities with St. Louis on the Air host Don Marsh. Blair, who joined St. Louis on the Air host Don Marsh to discuss the possible future of our roadways, is one of the leaders of MoDOT’s “Road to Tomorrow” initiative, which began last June to research and vet different areas of innovation in funding, infrastructure and technology that Missouri could become a leader in. 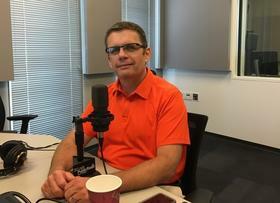 His team has considered pilot explorations of things like solar roadways, truck platooning, energy and advertising in order to keep Missouri roads ahead of the technological curve. What’s different about the project, however, is how focused MoDOT is on using it to find alternative sources of revenue for the cash-strapped department. After a year of research, MoDOT has decided to pursue projects in the areas of solar roadways, vehicle connectivity, smart pavement, truck platooning and alternative grant writing. “We don’t want smart cars running on dumb roads,” Blair said. Blair said that some leaders in the field say innovations like these could be implemented in a matter of months, others say they are 75 years away. Blair is convinced they’ll be in our lives sooner rather than later. So he’s preparing to make those innovations profitable for the Department of Transportation now — projects are not considered unless they bring in revenue. One of the innovations, solar roadways (which function to generate electricity that the Department of Transportation could make money off of to fund infrastructure repairs), could begin to be implemented at the Route 66 Missouri Welcome Center on I-44, as early as this November. Inspired by the thought of a totally differently-operating roadway? Blair’s always open to ideas. You can share your ideas for the future of Missouri transportation here. If they’re good, MoDOT will give you a call.